Ultrasound medical equipment has become standard in almost every medical office and clinic in the United States. Ultrasound procedures are available for viewing patients with a non-invasive imaging device for any ailment that they may have. It can be used as a screening tool for many potential problems that, if detected early, can save a patient's life. Originally, ultrasound was used to image the fetus in pregnant women. The ultrasound test would show the doctor and mother a live baby that was progressing at a normal rate of growth. It was very good for both the mother (and father) as well as the physician to see that everything was OK.
Later ultrasound was used to help the clinician insert a needle in the abdomen to draw amniotic fluid from the pregnant mother for genetic testing. This was used particularly on older mothers as a way to determine if there were any genetic defects in the fetus. Ultrasound medical equipment is now used for cardiac, vascular, urology, OB/GYN, MSK, and many other purposes. This equipment has become the means to a window into the patient that the clinician uses to see what is going on. Originally made by just a few small companies, now ultrasound medical equipment is made by almost every large company in the medical equipment market. A consolidation of companies has occurred with the large companies buying up all the small ones. There are portable ultrasound systems as well as full size systems on wheels and every size in between. Ultrasound can be used in the radiology department of a teaching hospital or in the emergency vehicle of a first responder. It is a very versatile tool. It is important that the user finds the right system for the application they will be performing. It would be silly to expect the same piece of equipment used in the Radiology department would be best for the independent OB doctor. One size does not fit all. 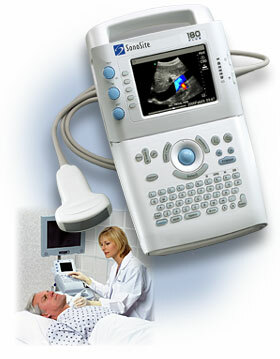 Ultrasound systems can be purchased as new or as used. Some of the used systems when refurbished properly can be a better value for some clinical settings and ultrasound applications. We are here to help you determine what equipment is right for your situation. Contact us by using the form below and we will be ready to help.